Earlier today, we reported on the possibility that Sprint, one of the major cellphone carriers in the United States, might be getting the next-generation iPhone with an unlimited data plan. If you weren’t happy with that and needed more evidence, consider this: Sprint is keeping all of its employees for taking time off in the first half of October ahead of “a major phone launch”. 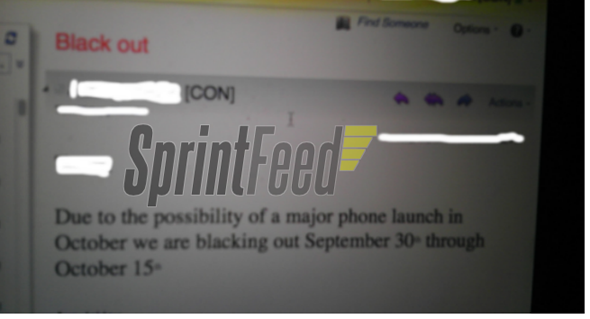 The new report comes from a Sprint insider who has obtained another memo sent to all employees imposing a “blackout” between September 30th to October 15th “due to the possibility of a major phone launch in October”. A “blackout” is corporate jargon for banning all vacations and time off during a certain period of time, two weeks in this case. Sprint will likely take this time to train all of its store clerks to offer service for the new device, much likely the iPhone 5. This is not the first Sprint memo we’ve seen alluding to the new iPhone. Earlier this month, Sprint sent a message to all of its employees instructing them not to comment on rumors or speculation about the iPhone 5 with customers, directing them to Sprint’s press site instead. If that’s not enough evidence, another leaked memo, this time from Best Buy, makes reference to Sprint iPhone 5 to be released in October. Back when the original iPhone launched in 2007, it was exclusive to AT&T customers, until earlier this year when a CDMA version of the iPhone 4 reached Verizon. If recent speculation is to be believed, Apple’s smartphone will reach the remaining two major United States phone carriers: Sprint and T-Mobile. Apple’s move, if it does indeed happen, will largely benefit Sprint which has been struggling to remain competitive as other carriers have managed to obtain far better phones at a faster pace. If the iPhone does indeed come to Sprint with an unlimited data plan, as it’s been rumored, Sprint could become a go-to carrier for power users who need to access a lot of Internet data on the cell network and put pressure on its competitors to lower their prices, given that no other carrier currently provides a similar plan. The iPhone 5 is Apple’s next-generation smartphone, which is expected to be announced sometime this month at the company’s media event. Among other features, the iPhone 5 is expected to include a larger screen for enhanced video playback and a more powerful dual core processor.